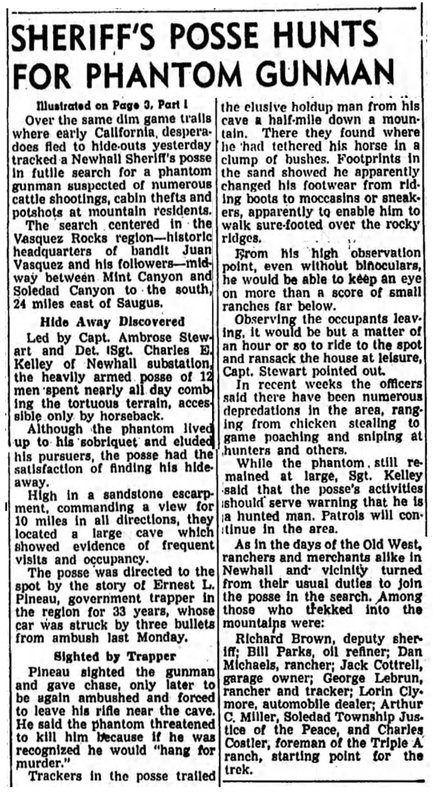 SCVHistory.com | Agua Dulce | Sheriff's Posse Searches for Phantom Gunman of Vasquez Rocks, September 1945. Sheriff's Posse Searches for Phantom Gunman of Vasquez Rocks. News Reports | September 1945. Sheriff's Posse Hunts for Phantom Gunman. Los Angeles Times | Thursday, September 20, 1945. Over the same dim game trails where early California desperadoes fled to hideouts yesterday tracked a Newhall Sheriff's posse in futile search for a phantom gunman suspected of numerous cattle shootings, cabin thefts and potshots at mountain residents. The search centered in the Vasquez Rocks region — historic headquarters of bandit Juan Vasquez and his followers — midway between Mint Canyon and Soledad Canyon to the south, 24 miles east of Saugus. Led by Capt. Ambrose Stewart and Det. Sgt. Charles E. Kelley of Newhall substation, the heavily armed posse of 12 men spent nearly all day combing the tortuous terrain, accessible only by horseback. Although the phantom lived up to his sobriquet and eluded his pursuers, the posse had the satisfaction of finding his hideaway. High in a sandstone escarpment, commanding a view for 10 miles in all directions, they located a large cave which showed evidence of frequent visits and occupancy. The posse was directed to the spot by the story of Ernest L. Pineau, government trapper in the region for 33 years, whose car was struck by three bullets from ambush last Monday. Pineau sighted the gunman and gave chase, only later to be again ambushed and forced to leave his rifle near the cave. He said the phantom threatened to kill him because if he was recognized he would "hang for murder." Trackers in the posse trailed the elusive holdup man from his cave a half-mile down a mountain. There they found where he had tethered his horse in a clump of bushes. Footprints in the sand showed he apparently changed his footwear from riding boots to moccasins or sneakers, apparently to enable him to walk sure-footed over the rocky ridges. From his high observation point, even without binoculars, he would be able to keep an eye on more than a score of small ranches far below. Observing the occupants leaving, it would be but a matter of an hour or so to ride to the spot and ransack the house at leisure, Capt. Stewart pointed out. In recent weeks the officers said there have been numerous depredations in the area, ranging from chicken stealing to game poaching and sniping at hunters and others. While the phantom still remained at large, Sgt. Kelley said that the posse's activities should serve warning that he is a hunted man. Patrols will continue in the area. Richard Brown, deputy sheriff; Bill Parks, oil refiner; Dan Michaels, rancher; Jack Cottrell, garage owner; George Lebrun, rancher and tracker; Lorin Clymore, automobile dealer; Arthur C. Miller, Soledad Township Justice of the Peace, and Charles Costler, foreman of the Triple A ranch, starting point for the trek.